I’ve been an Optimizely certified expert for a couple of years and have now trialled Google Optimize 360 for a few months, so it seems a good time to compare how they stack up. 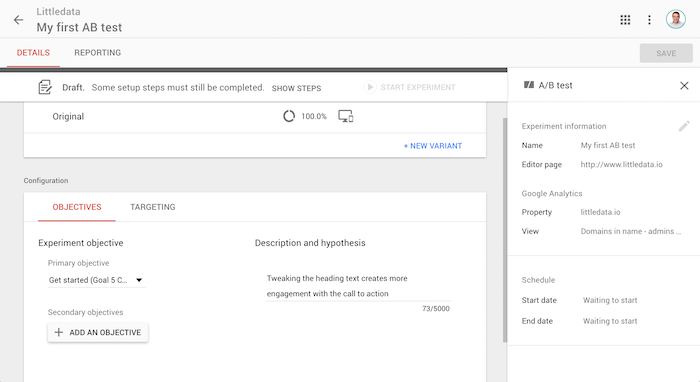 Google Optimize is an equivalent testing tool, and has copied much of the user interface that made Optimizely popular: you can click on elements within the page to experiment, and change their style, hide them or move them. My only complaint is that the interface is so simple it can take a while to unbury powerful features, such as transform the page via a custom script. There have been many success stories of companies implementing Google 360. Technically, Optimize’s editor is a bit smoother; using a Chrome plugin avoids some of the browser security issues that bugged Optimizely (since internet browsers confused the Optimizely in-page editor with some kind of script hacking). For example, to load Littledata’s homepage in their editor I have to enable ‘insecure scripts’ in Chrome and then navigate to a different page and back to force the editor to re-render. 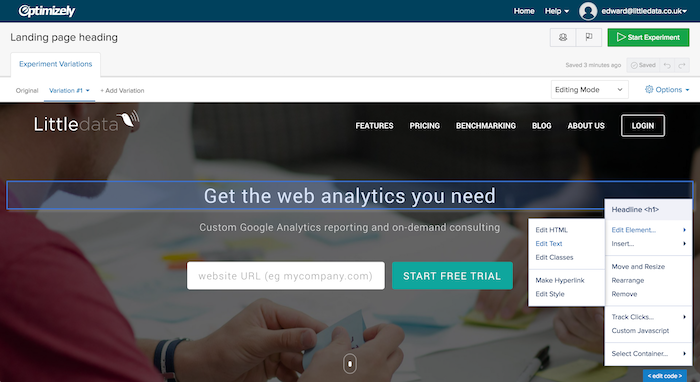 For reporting, Google Optimize 360 gives the ability to see results either in Optimize or as a custom dimension in Google Analytics – so equivalent to Optimizely. 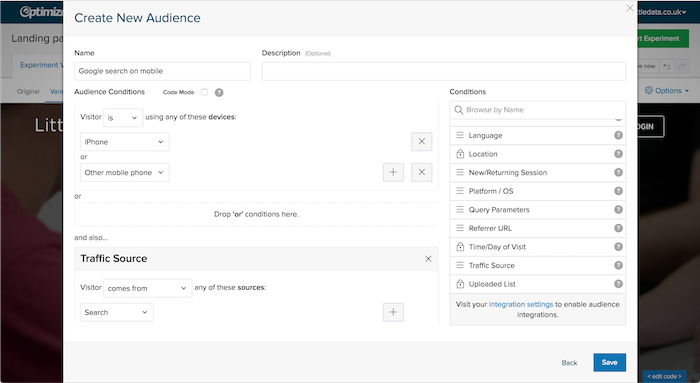 Right now Optimize lacks some features for advanced scheduling and user permissions, but I expect those to evolve as the product gathers momentum. Optimizely allows you to target experiments based on the device accessing the page (mobile vs desktop, browser, operating system) and for enterprise plans only to target based on geolocation. The limitation is that every time Optimizely needs to decide whether to run the test, the check for the user’s location may take a few seconds – and the landing page may flicker as a test rule is triggered on not. 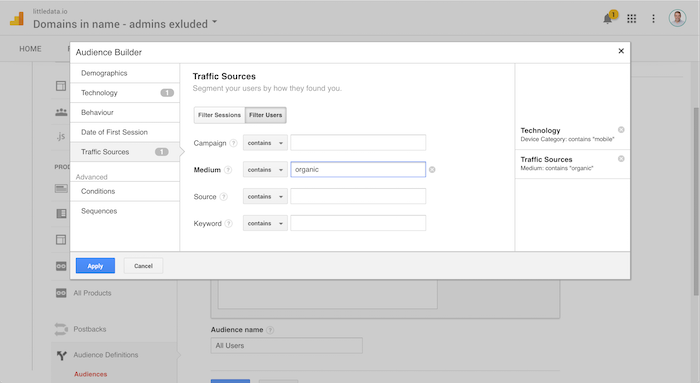 Google Optimize can target to any audience that you can build in Google Analytics (GA). This means any information you capture in Google Analytics – the number of previous visits, the pages they have previously seen or the ecommerce transactions – can be used in a test or personalisation. For example, in Google Optimize you could serve a special message to users who have previously spent more than $100 in your store. Optimizely has no knowledge of the users’ actions before that landing page, so the only way you could run an equivalent personalisation is to expose this previous purchase value as a custom script on the landing page (or in a cookie). The beauty of Google Optimize is that you are targeting based on information already captured in Google Analytics. There is no technical setup beyond what you were already doing for Google Analytics, and it doesn’t take a developer to build targeting for a very specific audience. Optimizely starts from under $100/month, but to get access to enterprise features (e.g. for geo-targeting) you will need to spend $2000 plus per month. Google Optimize is currently being sold at a flat rate of $5000 / month for the basic tier of Google 360 customers (which have between 1M to 50M sessions per month), but in future, it could be offered at a lower price to smaller companies. Where you’ll appreciate the benefits of Google Optimize is for running personalisations based on complex rules about previous user behaviour, or the campaigns they have seen. The more different tests you are running, the more time and simplicity saving you will get from building the audience in Google Analytics rather than some custom scripts. Google Optimize 360 is currently in beta but you can currently add your email to invite list. For smaller customers, or those with less complex needs, Optimizely still offers better value – but that might change if Google were to offer a limited version of Optimize at a lower price.